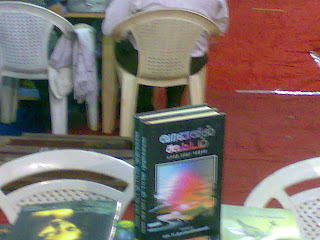 I was browsing in the Chennai book fair when I noticed a book prominently displayed with an attractive cover. It was called "Vaanavil Koottam" (Group of Rainbows). I had seen this book name earlier (at least an year back) in my email. On a hunch, I picked up the book and turned and the inner cover had my name! 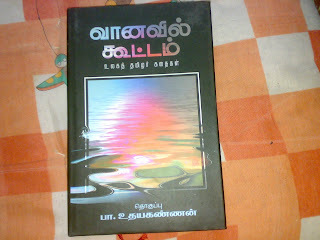 It is an anthology of short stories and the second short story is "Garvam" (Pride). By A.R.Ramiah (that is me). Here are a few pictures of the book and display. This story was written along with others 5 years back when I was in the US. I had lots of time in my hand and wrote a series. 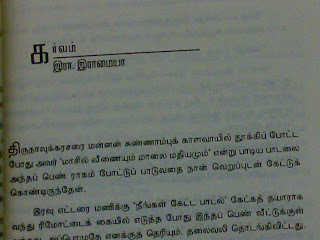 Then I sent it to Kalki magazine (I had won a short story competition many years back in Kalki and hence liked them). They said it was too long. So I just kept it for a couple of years. In 2006 I published it in Thinnai, the online magazine. A couple of months later I got an email from someone who said they wanted to publish it and asked for my address. I was worried for some reason and did not provide my address. It seems they went ahead and published it anyway. I talked to the publisher. I was actually not upset - it made me happy to see (after such a long time) my story in print. 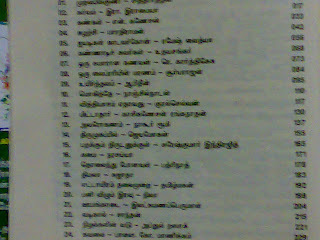 He said they had to get approval from 37 writers (including Sujatha and Jeyamohan). I felt sorry for him. I somehow feel more motivated now. I have not been able to complete a single good short story since I came back. I have not felt good about the ones I wrote recently. But this is motivating. Thats a great news indeed! Great going dude. Congrats on the achievement. The publisher should have informed you later atleast that they published your story. It is the right thing to do. You were lucky to find it out. I am happy for you. Congratulations. When are you planning to publish the collection? the ones that you don't put on this blog. By the way, what do you mean by "along with others"? As for as I know, you are not a good short story writer yet! If someone have published it along with the legends, then there should be something in it. Perhaps, I will change my assumption after reading this story. Don't take it offensive, I am not a good writer, but I am a better criticizer I believe. I will post my thoughts about the story after reading it! The story is here (spelling mistakes and all). With all humility, I have not published any of my (what I consider) better short stories in this blog. I am worried about people stealing it. The ones I publish here are basically stories I am not happy about for some reasons. Having said that, it is of course possible that the stories I LIKE may be bad too. I have usually gotten positive feedback from magazines. By the way, being published with legends does not mean anything - book publishing is a very weird business in Tamil and publishers are not the ultimate decider of quality. You may yet read the story and hate it. It's really good. 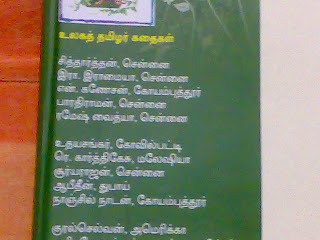 but it's not a short story, As they use to put in Vikatan " Satre periya Sirukadhai". Shaffi, Adhiga Prasangi. Adangu mudhalla. Actually short stories can be pretty long - this is just 15 pages long. There are others which are much longer. Actually nowadays I am not writing very well. In the US I had time and space to concentrate. Here it is always work. I am telling myself that is the reason. Let us see. Now the life is under your control rite? Thats the reason, why you quit Photon!? Ram, congratulations on getting a story published. Don't know why, but certainly I believe there's something special in seeing our work "in print" than online. Thanks for the copy. Good style. I think I would have liked it more had I read it when you first published it on Thinnai. Congrats!! Do you have a translation of this? கதை எனக்கு மிகவும் பிடித்திருந்தது. நண்பர்களின் வேண்டுகொளுகினாக, உங்களின் இந்த கதையை என்வளைதலத்தில் பதித்துளேன். தொடர்க உங்கள் பணி.